Registration is now open! 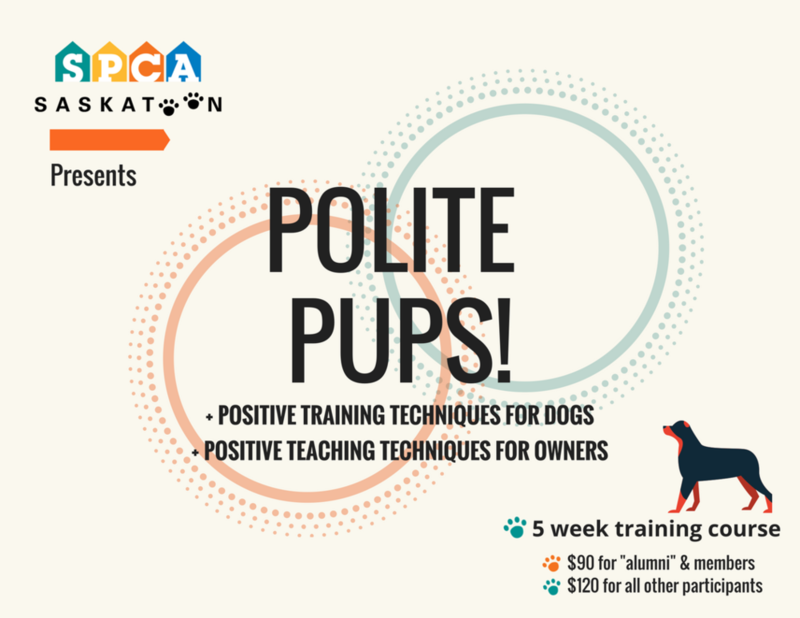 Join us for this fun & rewarding class held at the Saskatoon SPCA, where you and your dog can learn together! Our instructor is a Saskatoon SPCA staff member, a Certified Professional Dog Trainer, and a Certified Canine Behaviour Consultant, providing you with access to a wealth of knowledge and years of experience. Please note that your choice of Monday or Tuesday classes is on a first come, first served basis, and by filling out the below form, you are indicated your preference only - you may be moved to the other class day if your first choice is already filled! Classes cost $90 for "alumni" (dogs adopted from the Saskatoon SPCA) and Members of the Saskatoon SPCA, and $120 for all other participants. If you qualify for the discounted rate, please email communications@saskatoonspca.com with your full name for your exclusive promo code before registering. Please note: All dogs must be 4 months of age or older, all handlers must be 18 or older, and we require at least one handler per dog to participate. Spaces are limited, so click here to register now!